After a less than scorching hot start to our Southern Ontario summer, July brought in a real heat wave. 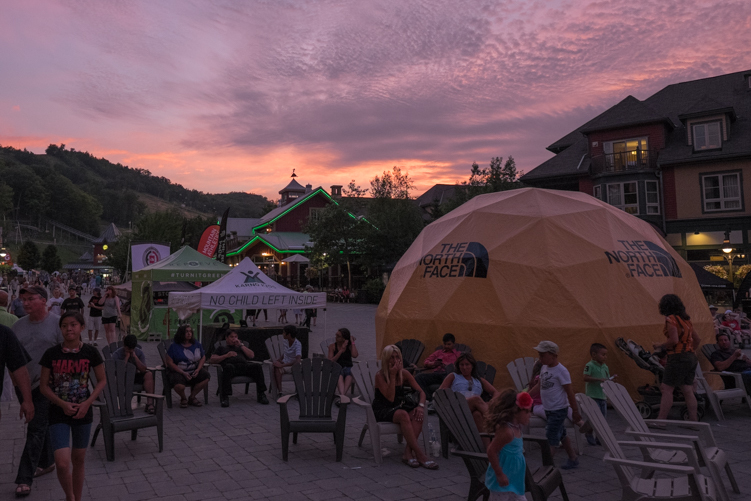 The opening ceremonies for this warm spell happened to be the 2015 North Face Endurance Challenge Series Ontario race at Blue Mountain. Back for its second year, the races (distances from 5km to 80km) offered some serious elevation gain over a mix of terrain from road to singletrack to ski slope (up and down). All of the technical parts of putting on a big race like this were totally dialed in as I have come to expect from the TNF ECS series. With years of races all over the world under their belts, even a newer stop like Blue Mountain is very well executed by their team. 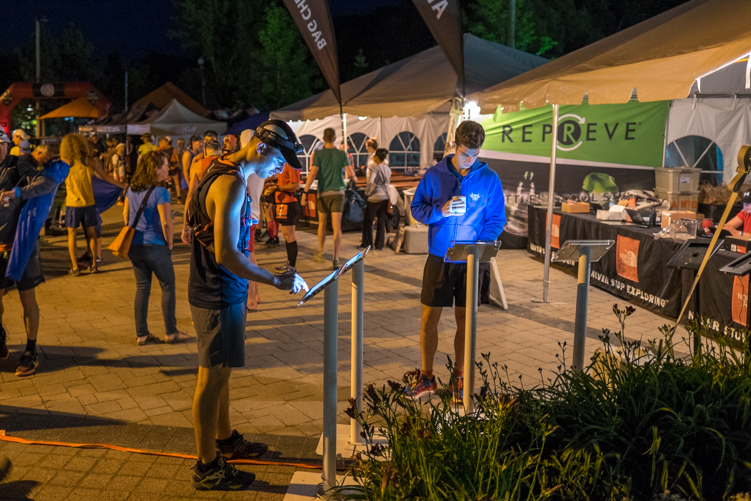 Everything from registration to packet pickup was quick and easy. The course was well marked, and the minor route issues I heard about last year seemed to have been resolved this year. You can’t miss the trail markings on this course! My favourite part of the Blue Mountain race is the setting. 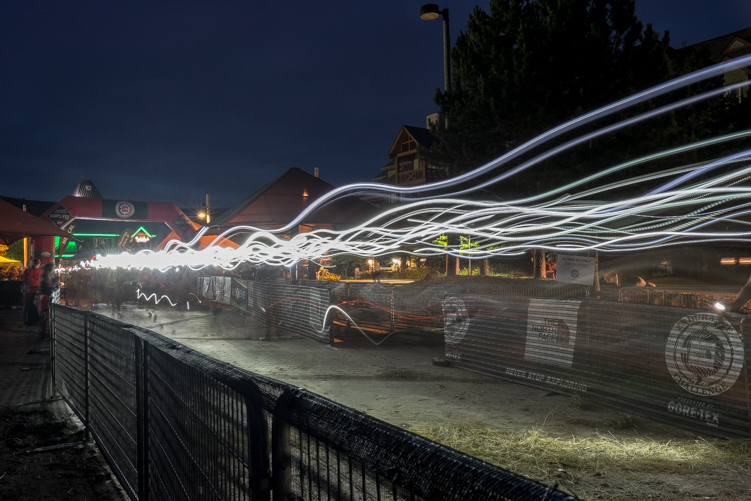 With the start/finish happening right in the middle of the resort village, there are tons of nearby accommodations and getting to the race is easier than what is faced at many other races. We stayed right in the village so race morning just involved a few hundred foot walk to the start line – much nicer than a more typical process of waking up, driving to a shuttle, then riding the shuttle school bus to the start line. 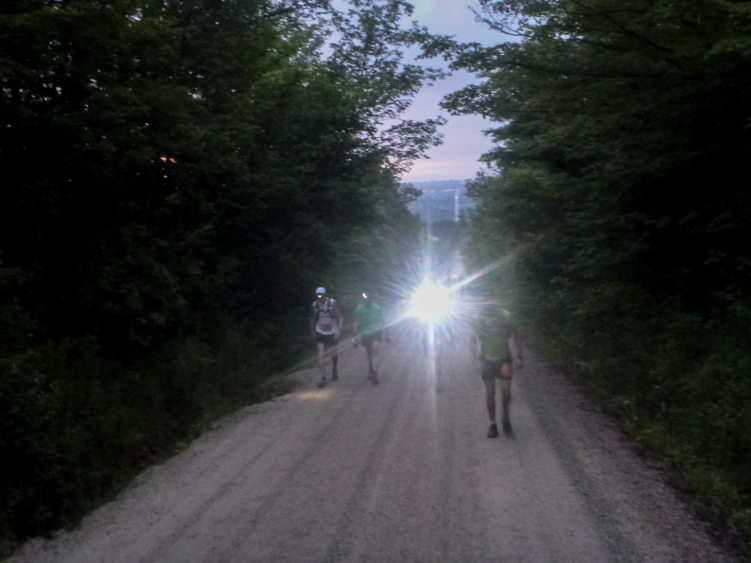 At 5AM, Dean Karnazes imparted some wisdom, wished us well, and sent us 80km runners off into the dark for our first lap up the ski hill. The first long climb was definitely my favourite of the day. The route traverses the ski slopes and heads to the top of the escarpment on smooth singletrack. Its a logical climb that takes you to the top of the most pronounced feature of the course – once up on top the rest of the 40km lap played out over a variety of singletrack, gravel, and asphalt. I found the course mentally challenging for two reasons. First, the 80km race is two 40km laps – always a challenge to head back out over the same terrain after 40km of running. 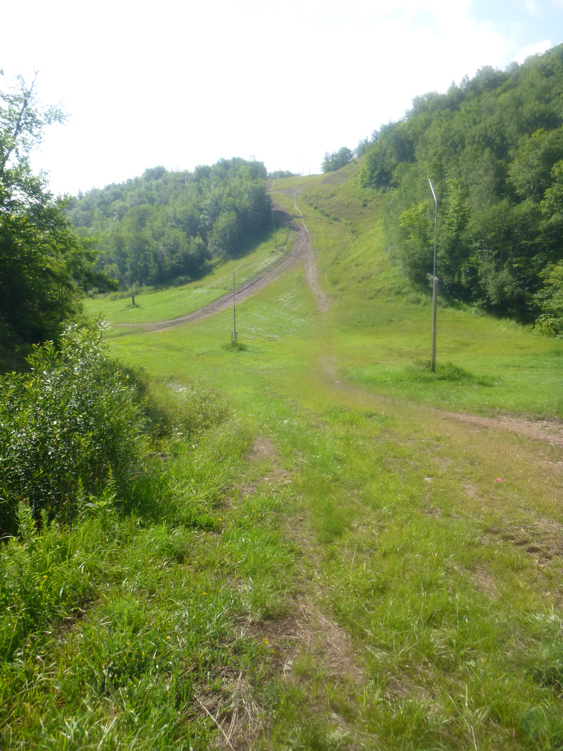 Secondly, the end of the course includes a series of trips down and up the middle of ski runs. 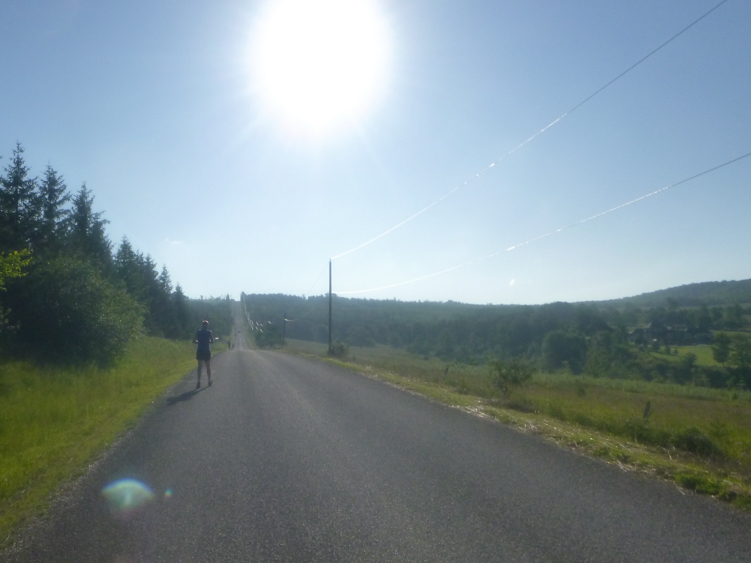 This isn’t a logical part of the course – you run down simply to run back up and you are in the baking hot sun the whole time. It really tests your ability to maintain a positive mindset, but that’s part of ultrarunning. The reward for this struggle is the best of the course – the final descent back down to the village. This is a 1.5km stretch of fun, technical, downhill singletrack that wakes up the legs and mind as you make your way back to the halfway point, and eventually the finish line. Great place to watch the sun rise! Another great part of this race was the aid stations and volunteers. On a hot day like this the aid stations play a few vital roles. TNF ECS aid stations are always super well stocked with a variety of food, drinks, and most important at this race; ice. The other thing the aid stations do is make sure racers are safe. I was impressed with how often volunteers asked how I was doing, how I was feeling, and what I needed. They kept an eye on the racers and paid special attention to those who appeared to be suffering in the high temperatures. I was offered buckets of water over my head, ice, and anything that would help cool me down and gladly took advantage of it. Consisted of 4, 10K loops. Technicality: The 10KM loop didn’t have any paved sections and consisted of well groomed trails and the ski runs. Running the loop twice, back to back, in 30 degree heat with humidity was a physical and mental challenge. The 4 or 5 climbs in the second half of the 10K were intense as they were in the open field and just as you thought you were done, there was yet another hill to climb. Overall, my Suunto watch registered 843m of total ascent for two loops. Like Kent, my favourite part was at the very end of the course, on a windy trail with beautiful views, a water stream and some steep, what seemed like hand made stone stairs. This section made me forget about the uphills and tune into my legs and feet as every step mattered. Course Measurement: Suunto came in at 22.5km. Overall, the relay was a rewarding race. If you’re considering running it with just 2 people, I wouldn’t recommend running the loops back-to-back due to weather and the physical challenge of the course. Alternate back and forth with your partner and do a lap at a time. 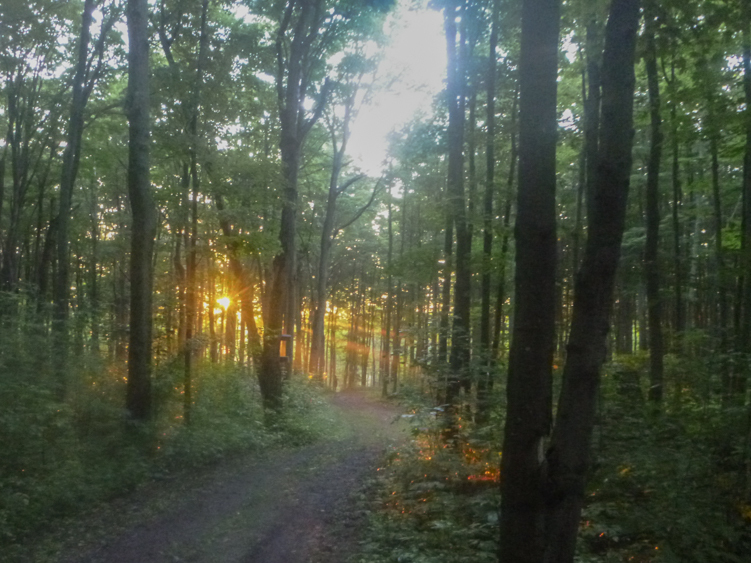 Technicality: I would highly recommend the ECSON half marathon to a new trail runner because of the course’s variety. It offered a great balance of captivating trails, challenging climbs and descents, as well as some road running, which I’m sure road runners appreciated. The course started with a long climb that turned into a road climb, followed by beautiful and wide trails and finished with the gruelling ski run climbs mixed with steep and one challenging downhills. Overall, my Suunto registered 738m total ascent. Nice review. I look forward to the challenge again next year. I might even go up in distance.